“This country needs to get back to the way it was.” That was 60-year-old David Moffett telling a New York Times reporter why he voted for David Brat, the giant killer who brought down House Majority leader Eric Cantor in a Virginia Republican primary. With nearly all the votes counted, Brat had 56 per cent to Cantor’s 44. The Brat campaign, of course, portrayed Cantor as being hypocritical, and Tea Party supporters knocked on doors and made phone calls, spreading the word. The Cantor campaign raised about $5.4 million compared to $231,000 for David Brat, an economics professor at a local college (Photo above P. Kevin Morley, Richmond Times-Dispatch). It was one of the biggest upsets in US political history – no sitting House majority leader has lost since the position was created in 1899. Apparently, this religious theme does not extend to his supporters, some of whom are, apparently, brats (I had to use that somewhere). As Amanda Terkel reported in the Huffington Post: “Brat had a loud, committed following on the campaign trail, generating an intensity that Cantor failed to muster. 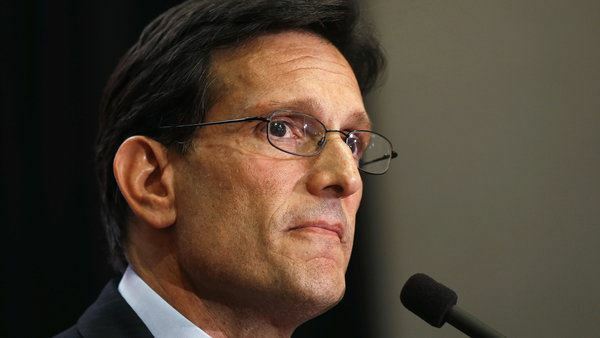 During a local GOP convention last month, Brat backers loudly booed Cantor in front of his family.” http://huff.to/1oWPG6J The boos erupted because Cantor had dared to claim Brat had used “inaccuracies” in his campaign. But it’s obvious that Barack Obama’s agenda, already under threat, will be under attack as never before. With only two and a half years left in the Obama presidency, a poor result in the mid-terms could spell disaster. The Democrats do have a chance, though, with their grassroots campaign, raising funds by asking supporters to contribute as little as $3 each. But, as David Brat has demonstrated, money doesn’t always win elections. The Democrats need to have thousands of door knockers and phone callers to make it work. They had that in 2008, and, to a lesser degree, in 2012 to help Barack Obama to two terms in the White House. This could be the summer of campaigning dangerously. In one of their first statements on the primary, it was clear the Democratic National Committee was going on the attack and would portray the November election for Cantor’s seat as a race between a traditional Democratic candidate and a Far-Right Tea Partyer. DNC Chair and Florida Member of Congress, Debbie Wasserman Schultz, said: “When Eric Cantor, who time and again has blocked common sense legislation to grow the middle class, can’t earn the Republican nomination, it’s clear the GOP has redefined ‘far right.’ Democrats on the other hand have nominated a mainstream candidate who will proudly represent this district and I look forward to his victory in November.” Brat’s Democratic opponent in November will be Jack Trammell, like Brat, a professor at Randolph-Macon College. He’s also a political novice, the author of 20 books, who lives on the family farm with his wife and seven children, and teaches disability studies at the college. Brat lives outside Richmond, with his wife and two children, and helps run the Ethics Bowl, a competitive debate team, where he often banters with the team’s other adviser, a liberal professor. A student on the team told Jennifer Steinhauer Brat has a sense of humour. He’ll need it. It should be an interesting campaign, with the result certain to be far from academic. By then, the Democrats’ Hillary Clinton may be getting ready to announce her run for the presidency, the Republicans might have decided who their candidate might be (Paul Ryan and Ted Cruz spring to mind; Chris Christie blew it), and the Tea Party might have found someone as far right as Genghis Khan.